Four chairs with a ball in each are set up as shown. Players 1 and 2 sprint, pick up the ball, dribble and make a pass (dish) to players 3 and 4 who catch and shoot the ball. 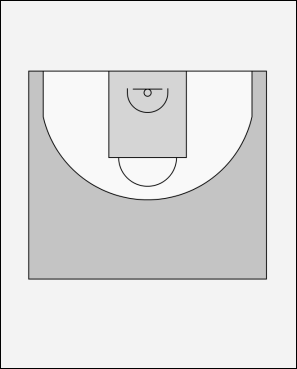 Players 1 and 2 then pick up the ball out of the two chairs high and shoot. - Players 3 and 4 rebound their shots and put the balls back above the 3pt line, then join the line at the 1/2 way line. - Players 1 and 2 rebound their shots put the balls in the chairs outside the elbows and then get ready to catch the next passes.